Every morning the hotel will give you a good morning with a tempting buffet, full of fresh fruit, homemade cakes and biscuits, ham, cheese and many other good things. Our food, healthy, wholesome, and offers a menu of traditional Mediterranean cuisine with a taste for fresh fish that you will find every day. 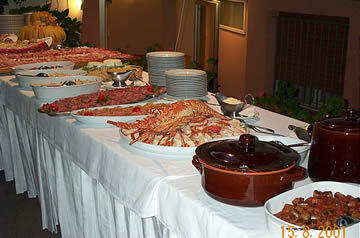 Lunch and dinner are accompanied by a rich buffet of appetizers, vegetables, cheeses, fruits and desserts. On request we prepare menus for special needs and food intolerances. For the children we are available for the preparation of their menu.